RateBeer Best awards for 2015 were announced January 15, 2016. Sergio’s is proud to be recognized as a top place to have a beer in the world. Start off 2016 with some hot, tasty new bites from Sergio’s! Smooth and creamy made from lobster. 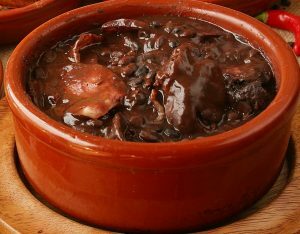 Black beans, pork, ham, bacon, and smoked sausage are the base for this delicious stew. Happy Holiday’s from Sergio’s! Stop by and visit us during these extended holiday hours to wind down 2015 with a delicious meal. We invite you to join us on New Year’s Eve (Thursday, December 31st, 2015) for a beer dinner. Plan to arrive for a fantastic evening at six for six delicious dishes paired with six unique beers for sixty dollars. Welcome to twenty sixteen. Advanced registration is required; click here to complete the form online. The deadline to register was Monday, December 27th, 2015. Price plus taxes and tips per person. Thank you for your interest, however the registration period has closed. Please check back again as future events will be featured here. Black Friday (Friday, November 27th, 2015): 1:59 PM – 2 AM (Early bird specials will begin at 1:59 PM).